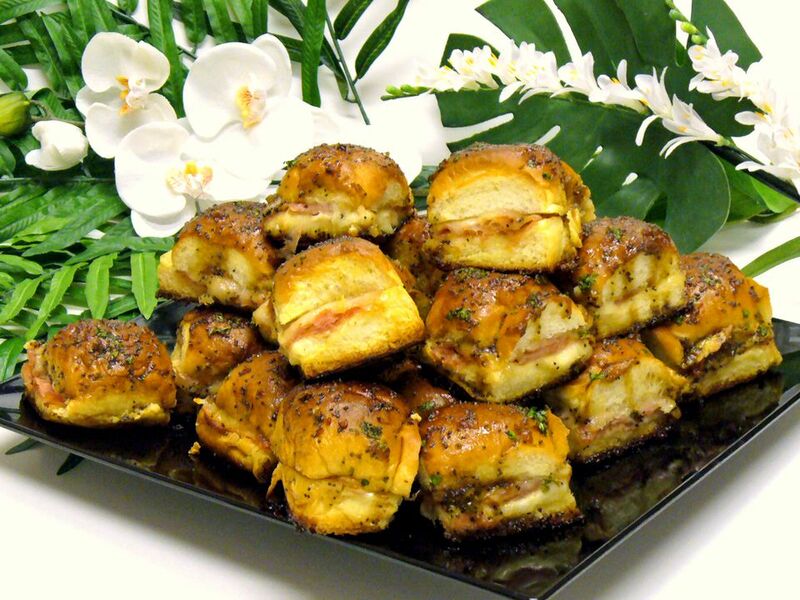 Marinated Ham & Cheese Buns Recipe. © 2009 Peggy Trowbridge Filippone, licensed to About.com, Inc.
Plan on making a double batch for any party or occasion, especially . Even guys ask for the recipe. Marinated ham and Swiss cheese buns make a killer , and better yet, you can make them a couple of days in advance before baking. Feel free to experiment using your favorite deli meats and cheeses in any combination. They all work well with this marinade. Be sure to read the notes below before you begin. Line two 9 x 13-inch (or one 10 x 15-inch) baking pans with non-stick foil or butter traditional pans. Saute minced sweet onion in butter over low heat until onion is soft and translucent. Add brown sugar, mustard, poppy seeds, Worcestershire sauce, and garlic powder. Stir and let gently bubble for 3 minutes until brown sugar is melted into the sauce. Remove from heat. Set marinade aside to cool while you assemble the buns. Remove buns from the package and do not separate. Using a long serrated bread knife, slice the entire sheet of buns in half so you have a layer of tops connected and a layer of bottoms connected. Flip the layer of tops away from you with cut-side up so you can easily reassemble them in the same order. Spread tops and bottoms of buns with a thin layer of horseradish mayonnaise. Layer ham slices to evenly cover the sheet of bun bottoms. Repeat with Swiss cheese slices in an even layer. Slice in between each row to separate buns into individual servings. Arrange ham and cheese buns into prepared baking pan(s). Spoon marinade evenly over buns, letting some marinade drip in between buns. Sprinkle buns with chopped parsley. Bake marinated buns covered for 25 minutes. Remove foil and bake an additional 10 minutes. The buns should be caramelized on the bottom and golden brown on top. Notes: Use pre-baked dinner rolls. They usually come in a sheet of 12 rolls, stuck together. If you use this type (we like the sweet whole wheat ones by King's Hawaiian), you should be able to slice the entire sheet horizontally to assemble, rather than doing each one individually. Be sure to slice through to separate the buns slightly before pouring on the marinade. Feel free to use your own homemade yeast rolls. If you are on a budget, adjust this method to use large hot dog rolls, cut into thirds or halves. Horseradish mayonnaise is easy to make at home, but there are decent commercial varieties to use as a shortcut. You can use traditional mayonnaise if you need to avoid horseradish. For the ham, we used a rosemary sun-dried tomato deli ham, but feel free to use your favorite. Just be sure it is sliced very thin (ask for it shaved) and use a high-grade, low-moisture ham for best results. The buns are equally as good using smoked turkey or roast beef. If you are unable to use poppy seeds (they can be bothersome in the teeth and sometimes cause a false-positive result in drug tests), you may substitute sesame seeds or omit them altogether.